The Archival Methods 20.5 x 24.5 x 3" Drop-Front Gray Archival Storage Box can hold a wide variety of material safely and securely. This box is archival in design and is made from heavyweight ArchivalGrade boxboard. Use it for anything from old newsprint to pamphlets. We all have boxes and boxes of old images that we inherited from our families. Most of these photos are usually stored in attics and closets in old-fashioned cardboard boxes that are subject to degradation from humidity, water and other elements. 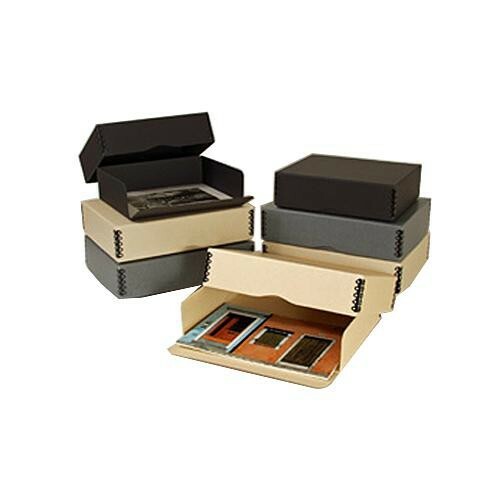 Archival Methods Storage Boxes are high-quality containers not only perfect for today's digital revolution but for preserving your older traditional prints. With Archival Methods, your precious memories will remain intact and allowed to be safely passed on to future generations. Box Dimensions (LxWxH) 25.5 x 21.5 x 3.5"
01-539 Drop Front Archival Storage Box (20.5 x 24.5 x 3", Gray) is rated 3.0 out of 5 by 1. Rated 3 out of 5 by Anonymous from Good storage box for the money We had a need to store hundreds of 18x24 photo enlargements. These boxes are relatively inexpensive but sturdy. The reinforced corners add to their durability and the drop front feature make it easy to add more photos.